Phone banking during election season is a battleground of frustration and enlightenment. But doing so the last stretch of the weekend before the 2018 midterm elections can be a matter of life or death. It’s not easy to get up on a Saturday morning to phone bank for the American Civil Liberties Union at The Standard Hotel’s Narcbar. The little luxury coffee-shop style bar was filled with people of all ages. Some of which who were first timers and some who have been veterans. College aged students anxiously re-read their scripts again and again in their booths to make sure that they weren’t going to stumble their words. Old men with new laptops recounted their first phone bank about 30 years ago. Middle aged women were blistering with confidence and embracing other volunteers who they have worked with in the past, asking how they have been, and what other canvassing jobs they were doing this past election season. While the bustle is going on, several volunteers ask for a cocktail from the bar or a cup of coffee to relax before asking strangers about their state legislation. “So, are you sure you are registered to vote?” asked one woman volunteer to the bartender. “Yeah, but somehow I’m registered for both Massachusetts and New York,” she said while the woman was frantically searching for her voter registration status online. It turns out she was in fact only registered for New York. These civically engaged citizens are the forefront in the effort of making Virginia voters aware of Amendment 1 on their state ballot, which may restrict a woman’s right to abortion and gives leeway for politicians to pass more laws that are restrictive and puts a woman’s life in danger. “We just want to give voters the last final push to say no on this amendment,” said ACLU organizer and Standard Hotel employee Caitlin McConnell. Pushing against the terrors of the current administration and even at state levels, the ACLU fights these unjust causes with the help of the average citizen sacrificing a couple hours of their time. As an hour goes past, volunteers across the whole bar are glued to their laptops reading the provided script and calling Virginia voters through the phoning service Hubdialer. Volunteers flew by some of the calls with the average call being around 30 seconds and being constantly rejected. 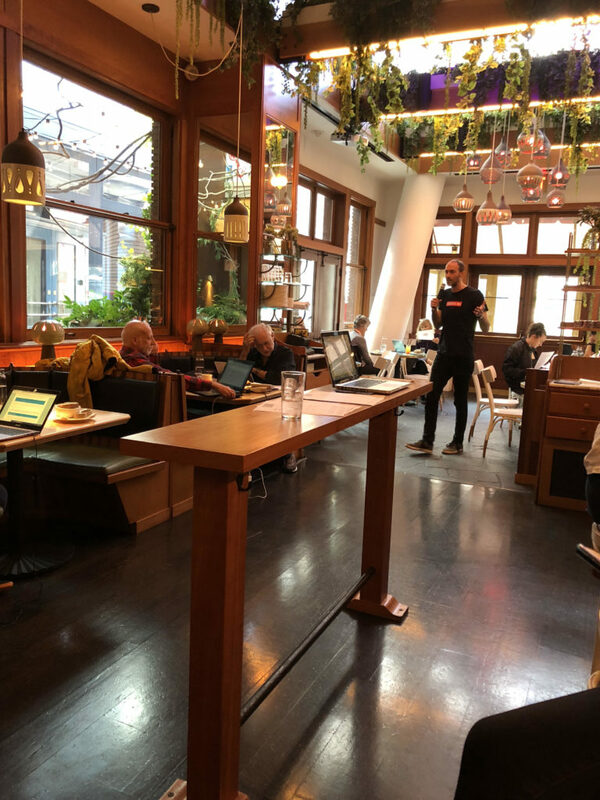 This Sunday evening a phone banking campaign event for Texas Senate candidate Beto O’Rourke was hosted at a Flatiron District apartment. “Hi! This is Alexa, I’m calling for Jose. Is this a good number to reach Jose?” A volunteer questions into her headset. At least ten people of visibly varying skill-levels, backgrounds, and demographics fill various sections of the two-bedroom apartment equipped with laptops, cell phones, and headphones with attached microphones. With each volunteer nearby making calls every minute, they all hold their headphone microphones close to keep their voices as clear as possible to the other end. The environment seems atypical of what many would envision a political phone bank to be. The host is handing out glasses of water to those working in the living room and offering assistance to those who lack experience. In the office, an older gentleman received help with learning to maneuver the server with the numbers to call and the script by which he was to follow. “How do I improvise? I don’t know where to tell them where to vote and what information to even give.” The host sat with him to walk him through the server which gives all sorts of information on the caller — age, where they are registered to vote, home district, nearest polling place, and other pertinent information to their civic duty experience. The patience while helping the man learn to navigate the process is pertinent to keeping all demographics engaged in the process. He came to help and was doing so to the best of his ability. All who are there are volunteers committed to swaying last-minute voters or even just convincing them to vote and walking them through the process. Tonight, not many on the other end of the line are friendly and are annoyed that despite voting already or having plans to vote, their evenings are being interrupted by phone bankers. Volunteers suspect that it can be attributed to the close proximity to the voting deadline. Most have already made choices and volunteers must work carefully to not discourage them into not voting at all. Host Reeya Shah, a 26-year-old New Jersey native says tonight is her most crowded and most diverse turn out yet. As for why a New Jersey native who now resides in new york is hosting an event specific to Texan voters, Shah says she finds value in working towards taking back the Senate from states that have traditionally voted for Republican officers. “Living here in New York, I just felt that I can feel pretty confidently that Chuck Schumer and Kristen Gillibrand are gonna vote the way that I want them to but [wondered] ‘what can I do to help take back the Senate?’ I think that beating Ted Cruz and getting him out of there is a good way to do that.” Shah explained. Within the weeks leading up to the Nov. 6 election date, this Sunday was Shah’s third time hosting a phone bank for Beto’s campaign. Astoria, Queens — On the bustling street corner of Ditmars Boulevard and 31st Street, one young woman stands out among the crowd. 26-year-old, Hind Sophia, is spotted wearing a bright blue “Alexandria Ocasio-Cortez” t-shirt. Running on just a few hours of sleep, she still manages to flash a bright smile and hold a rambunctious puppy in her arms. On the gloomy Friday morning leading up to the election, Hind came prepared. Her canvas bag was overflowing with Ocasio posters, fliers, and pins in both English and Spanish. A now fully-caffeinated Hind once again took to the streets to canvass for Ocasio, this time visiting shops and restaurants along 31st Street, asking owners and managers to put up Ocasio posters in windows. Once again, Hind was met with more “no’s” then “yes’,” but nevertheless, the smile did not leave her face. She trudged on, stopping at nothing to find the one store that would agree to put her poster in the window. “Look it’s my poster!” she exclaimed as she passed by an Ocasio poster hanging outside of a Liquor store. “Well I vote for every election cycle but today felt especially important with the energy, and social media and the news…. 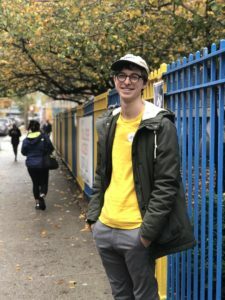 I hope to see the largest voter turnout for a midterm election, especially for the youth.” – Dustin, 27, graphic designer, Lower East Side. Three weeks from the midterm elections and NYU senior Toyosi Oyelola was still carrying her voter absentee form in her backpack. Her Application for Ballot by Mail (ABBM) to vote in Texas elections was just missing a stamp. Oyelola, who voted for the first time in the 2016 Presidential Elections, is among the young Americans that will be voting by mail in the incoming weeks from different states, and even from different countries –many of whom don’t know where to find stamps for their ballots because they have never used one before. As a part of Gen Z, a politically-aware generation born after 1996, Oyelola believes it is critical to vote no matter where she is living. “It was very important to me to make sure that we can have a better future for Texas because Ted Cruz is not it,” said Oyelola, who follows the close race between Cruz and O’Rourke and worries about the US-Mexico border policies. 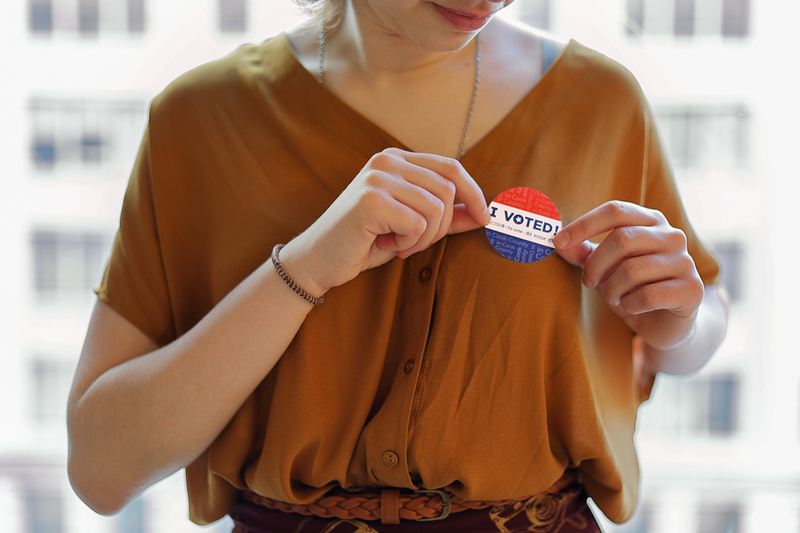 Last year, NYU sophomore Sarah Patt had to go to her hometown Village Hall in Glenview, Illinois because her online voter registration form failed. As with Oyelola, Patt is frustrated with the process of printing an ABBM form, mailing it in and then getting back a ballot that also needs to be mailed to her county’s clerk office. 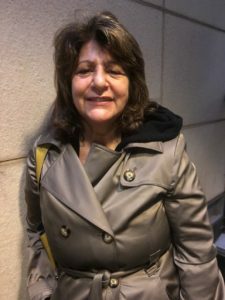 “I get why they want to protect the voters identities’ through this process but it’s a lot of work for something that it’s a fundamental part of the American experience,” said the first-time voter who is against a possible re-election to a third term for Illinois’ Gov. Bruce Rauner. 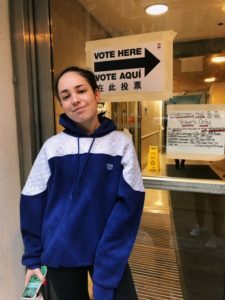 For some NYU students, studying halfway around the world may impede but not deter them from voting. First-year student Kai Elwood-Dieu will mail his ballot from the NYU campus in Shanghai. Native from Bethesda, MD, Elwood-Dieu says that studying in China will not stop him from showing his support to the Democratic party. Elwood-Dieu even wanted the NYU Shanghai student government to set up a voter registration booth. However, he was told that some NYU officials were concerned that doing so would show an American bias at a college where half of the student body is Chinese and the other half comes from 69 countries. In response, Elwood-Dieu and his classmate Anna Gabriel set up their own registration area: a table, two chairs and two computers outside of the cafeteria in the basement. In the two days of the temporary booth, 50 students registered. “I, in no way, want to force people to vote, but for those willing, I wanted to provide a resource with which to do so,” wrote Elwood-Dieu in an email interview. Absentee ballot voting started as a way to allow Civil War soldiers to vote for their representatives from the frontline and has now become a practice accepted in all the country. Advocates for voting by mail argue that it increases voter turnout and reduces the administrative costs of having polling sites. However, the requirements and deadlines to do so vary between states making it hard for Americans to understand how the process works.